Polar’s OH1 provides versatility, comfort, and simplicity. The OH1 is an optical heart rate sensor worn on the arm. Whether your students are in PE class, or working out on their own, this Bluetooth Smart heart rate sensor accurately and consistently captures  heart rate using Polar’s proprietary heart rate algorithm and 6- LED solution. The OH1 is available individually or in a pack of 10. Pack includes: 10 sensors, 10 straps and one washing bag. 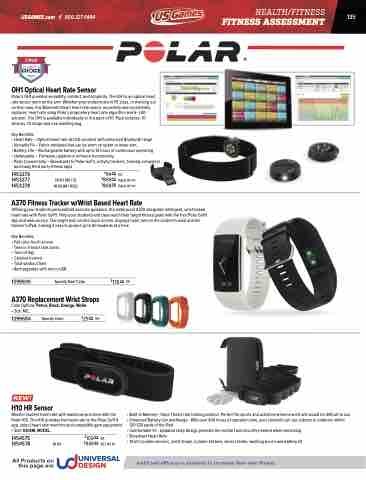 Offering your students personalized exercise guidance, the waterproof A370 integrates intelligent, wrist-based heart rate with Polar GoFit. Help your students and class reach their target fitness goals with the free Polar GoFit App and web service. The bright and colorful touch screen, displays heart rate on the student’s wrist and the teacher’s iPad, making it easy to project up to 60 students at a time. Monitor student heart rate with maximum precision with the Polar H10. The H10 provides live heart rate to the Polar GofFit app, select heart rate monitors and compatible gym equipment. • Size: XS/SM, M/XXL. Instill self-efficacy in students to increase their own fitness.